If one was to choose a district that best reflects what Shanghai was all about, it would be Huangpu (a prime area). 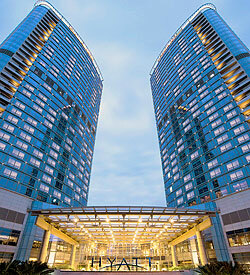 Located in central Shanghai on the Huangpu river, in this district beats the heart of the city. The clear waters and green landscapes titillate the senses, for this is the mother lode of all tourist attractions. Outside shopping along Nanjing Road, tourist favourites include the Shanghai Natural History Museum, People's Square, Shanghai Museum and the Shanghai Grand Theatre. All these buildings fascinate visually, and offer much for those looking to learn about Shanghai. Huangpu is not only the oldest and best-preserved area in Shanghai, it is the heart of Shanghai's local administration, and of culture and trade. Restaurants, gardens, museums, shopping plazas Huangpu is perfect for these. Families looking to settle will find it convenient as it offers schools, hospitals, specialty shops, and up-to-date supermarkets and department stores. Huangpu is also home to Nanshi, the city's most traditional Chinese neighbourhood, filled with original town homes (shikumen), food markets and small street kitchens; the scents and sounds of a slowly transitioning China, tucked away in the glitz and glamour of Huangpu. For those looking for no frills, low-rent accommodation, Huangpu has its share of economical housing. The Bund takes up a mile along the Huangpu River, in central Huangpu. It was the financial centre of China before the revolution, and its restoration after the inauguration of the Open Door Policy was psychologically important. The Bund is lined with well-preserved pre-revolutionary foreign banks and trading houses from the US, France, Britain, the Netherlands, Germany, Japan and Russia 52 of them, in diverse styles including Art Deco, Beaux-Arts, Baroque, Romanesque, Gothic and Renaissance. Unfortunately, the architectural quality of the Bund's buildings is generally lower than that of colonial domestic architecture, and visually it is rather uninspiring. However, the Bund offers spectacular views of the new buildings in Pudong, including the Oriental Pearl Tower and the Jin Mao Tower. The neighbourhood of People's Square is a magnet for young professionals, with many attractions, local and foreign entertainment and cuisine, and good public transport. While the amount of expat-quality housing is limited, the area around is great. It distances you somewhat from the bustle of commercialism and the touristy vibe, but puts you close enough to enjoy things.